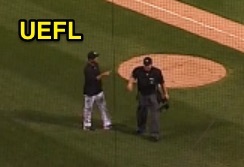 HP Umpire Joe West ejected White Sox Manager Robin Ventura for arguing ball calls in the top of the 7th inning of the Cubs-White Sox game. With two out and one on, White Sox pitcher Zach Duke walked Cubs batter Kris Bryant and surrendered a single to Anthony Rizzo on a 3-2 fastball. Replays indicate all 10 pitches ruled 'ball' by West to Bryant, Rizzo and preceding batter Kyle Schwarber were correctly officiated (100% Accuracy), the call was correct. At the time of the ejection, the Cubs were leading, 5-2. The Cubs ultimately won the contest, 5-3. This is Joe West (22)'s seventh ejection of 2015. Crew Chief Joe West now has 15 points in Crew Division (14 Previous + 1 Correct Call = 15). This is the 158th ejection of the 2015 MLB Regular Season. This is the 74th Manager ejection of 2015. This is the White Sox' 6th ejection of 2015, 2nd in the AL Central (KC 10; CWS 6; CLE, DET 5; MIN 3). This is Robin Ventura's 2nd ejection of 2015, 1st since June 17 (Alfonso Marquez; QOC = Y [Interference]). This is Joe West's first ejection since August 2, 2015 (Marlon Byrd; QOC = U [Fighting]).